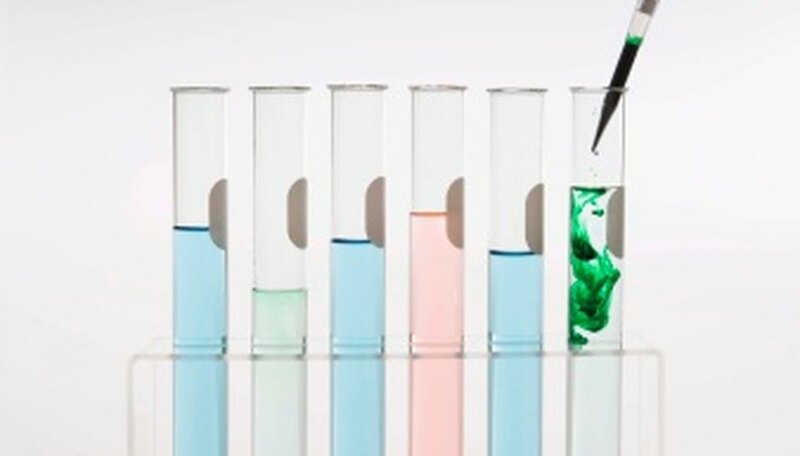 Design an experiment to teach your students how acidity and alkalinity affect enzyme reactions. Enzymes operate best under certain conditions relating to temperature and the level of acidity or alkalinity (the pH scale). Students can learn about enzyme reactions by measuring the time required for amylase to break down starch in buffer solutions covering a range of pHs. Use an iodine dropper to place one drop of iodine on each of the dimples of dimple tile. Label each of the test tubes to correspond to each buffer pH that you are testing. Start with the test tube for pH 6. Use a syringe to add 2 cm3 of amylase to the test tube, then add 1 cm3 of buffer and 2 cm3 of starch. Mix the contents of the test tube thoroughly using a plastic syringe. Wait 60 seconds. Add one drop of the solution that you mixed in step 3 to the first drop of iodine. The iodine will turn blue-back, indicating that your solution from step 3 still contains starch. Every ten seconds, add a drop of your solution from step 3 to another iodine drop on the dimple tile. Each iodine drop represents 10 seconds of reaction time. Continue to add your solution to iodine drops until the iodine remains orange, indicating that all the starch is broken down. Repeat steps 3 through 5 for all of the other pH buffers and quantify reaction time for each pH buffer. Graph pH for each buffer versus reaction time. Since temperature affects the rates of enzyme reactions, measurements taken on different days are not comparable. Avoid sampling delays that result in underestimating reaction time -- the main source of error in this experiment. Lobo, Tricia. "How to Design an Experiment to Test How pH Affects Enzyme Reactions." Sciencing, https://sciencing.com/design-ph-affects-enzyme-reactions-7975272.html. 24 April 2017.